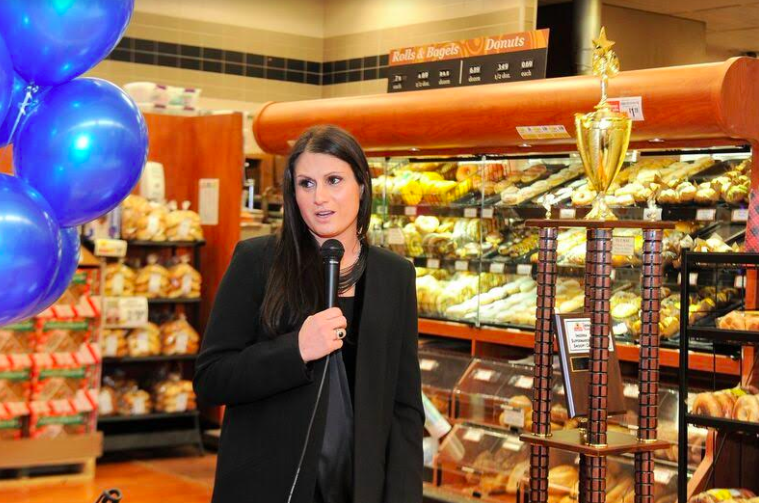 Lindsey Inserra, vice president of Health and Wellness and Marketing for Inserra Supermarkets, speaks at the ShopRite of Hoboken about fundraising for the Diabetes Research Institute. Inserra Supermarkets presented a check for $345,164 to the world-renowned DRI, the largest and most comprehensive research center dedicated to curing diabetes, during an event held at ShopRite of Hoboken earlier this month. The funds were raised during Inserra Supermarkets’ annual DRI fundraiser, and the Inserra Family Foundation matched every dollar raised during the campaign. Inserra Supermarkets is a local family-owned supermarket company dedicated to supporting national research and community organizations. For Inserra Supermarket employees and customers, raising funds to support diabetes research and treatment is a personal matter as many of them know someone who is living with the disease, including Lindsey Inserra, a fourth-generation family member who works for the company.